Synonyms and Other Names: Platypoecilus variatus, sunset platy, shortblade swordtail. Identification: Distinguishing characteristics were given by Rosen (1960, 1979), Page and Burr (1991), and Wischnath (1993). It was included in keys of Rosen (1960, 1979). Photographs or illustrations appeared in Rosen (1960), Mills and Vevers (1982), Petrovicky (1988), Dawes (1991), Sakurai et al. (1993), and Wischnath (1993). Native Range: Atlantic Slope of Mexico from southern Tamaulipas to northern Veracruz (Rosen 1960, 1979; Page and Burr 1991). Table 1. States with nonindigenous occurrences, the earliest and latest observations in each state, and the tally and names of HUCs with observations†. Names and dates are hyperlinked to their relevant specimen records. The list of references for all nonindigenous occurrences of Xiphophorus variatus are found here. Means of Introduction: Probably due to aquarium releases. Status: Locally established in Florida (Courtenay and Meffe 1989; museum specimens): a population in Alachua County, Florida, first recorded in the 1970s (Burgess et al. 1977), still survives. Locally established in Montana (Courtenay and Meffe 1989); possibly established locally in California (Swift et al. 1993). Possibly established on Oahu, Hawaii: listed as established by Maciolek (1984), but this species is not listed in the state by recent reports (Devick 1991; Yamamoto and Tagawa 2000; Mundy 2005). It was established locally in Arizona from 1963 to 1965, but that population was presumably destroyed by a flood in late 1965 (Minckley 1973). The species was reported from Colorado (Zuckerman and Behnke 1986). Remarks: Similar to some of the other poeciliids, this species exhibits considerable natural variation (e.g., Wischnath 1993). It has been popular as an ornamental fish for many years. Voucher specimens: Florida (UF 16992, 30868, 91926, 91927, 91928). Burgess, G.H., C.R. Gilbert, V. Guillory, and D.C. Taphorn. 1977. Distributional notes on some north Florida freshwater fishes. Florida Scientist 40(1):33-41. Courtenay, W.R., Jr. 1985. Florida Atlantic University Quarterly Reports for 1985 to the U.S. Fish and Wildlife Service, Gainesville, FL. Courtenay, W.R., Jr., D.P. Jennings, and J.D. Williams. 1991. Appendix 2: exotic fishes. Pages 97-107 in Robins, C. R., R. M. Bailey, C. E. Bond, J. R. Brooker, E. A. Lachner, R. N. Lea, and W. B. Scott. Common and scientific names of fishes from the United States and Canada, 5th edition. American Fisheries Society Special Publication 20. American Fisheries Society, Bethesda, MD. Courtenay, W.R., Jr., and G.K. Meffe. 1989. Small fishes in strange places: a review of introduced poeciliids. 319-331 in G.K. Meffe and F.F. Snelson, Jr., eds. Ecology and evolution of livebearing fishes (Poecillidae). Prentice Hall, Englewood Cliffs, NJ. Devick, W.S. 1991. Pattern of introductions of aquatic organisms to Hawaii freshwater habitats. 189-213 in: New directions in research, management and conservations of Hawaiian freshwater stream ecosystems. Proceedings of 1990 symposium on freshwater stream biology and fisheries management, Hawaii Department of Land and Natural Resources, Division of Aquatic Resources, Honolulu, HI. Hubbs, C.L., W.I. Follett, and L.J. Dempster. 1979. List of the fishes of California. California Academy Science Occasional Papers 133. Maciolek, J.A. 1984. Exotic fishes in Hawaii and other islands of Oceania. 131-161 in W.R. Courtenay, Jr., and J.R. Stauffer, Jr., eds. Distribution, biology, and management of exotic fishes. The Johns Hopkins University Press, Baltimore, MD. Rosen, D.E. 1960. 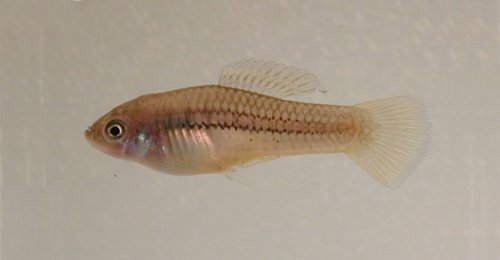 Middle-American poeciliid fishes of the genus Xiphophorus. Bulletin of the Florida State Museum Biological Sciences 5(4):57-242. Rosen, D.E. 1979. Fishes from the uplands and intermontane basins of Guatemala: revisionary studies and comparative geography. Bulletin of the American Museum of Natural History 162:267-376. St. Amant, J.A. and I. Sharp. 1971. Addition of Xiphophorus variatus (Meek) to the California fauna. California Fish and Game 57:128-129. Swift, C., T.R. Haglund, M. Ruiz, and R.N. Fisher. 1993. The status and distribution of the freshwater fishes of southern California. Bulletin of the Southern California Academy of Science 92(3):101-167. Williams, J.D., D.P. Jennings, and D.C. Haney. 1992. Exotics in the Indian River Lagoon System. National Biological Survey, Gainesville, FL. Unpublished manuscript. Wischnath, L. 1993. Atlas of livebearers of the world. TFH Publication, Inc., Neptune City, NJ. Yamamoto, M.N. and A.W. Tagawa. 2000. Hawaii's native and exotic freshwater animals. Mutual Publishing, Honolulu, HI.